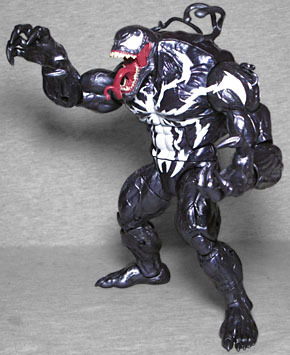 The Build-A-Figure for this Venom Marvel Legends series is Venom? Didn't see that coming! 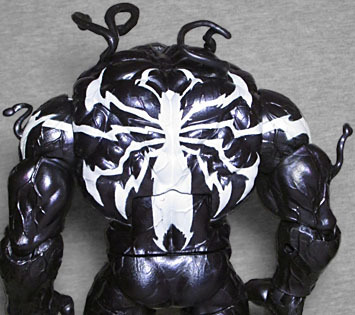 Although there's a plain Venom in the series, the BAF is a second Venom. Buy all six figures, and you get the pieces needed to build the big guy. Or maybe if you just buy/trade for the pieces you need, we've not going to tell you you must buy things even if you don't want them; that would just be rude. But we will warn you that even the figures that don't seem too special still have some good stuff going on. 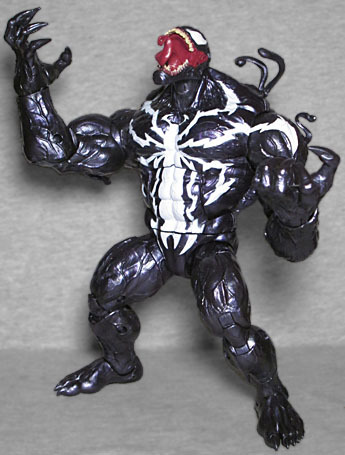 You may not notice it until you put the BAF parts next to the actual Venom from this series, but they're not the same color: the normal version is black, while this one is strongly tinted purple. Guess they didn't want you to get confused about which pieces went to which figure, especially with all the variant heads floating around among the various packages. The white spider on his chest is very wicked and jagged, and even wraps onto his shoulders. Shocka asked if this "Monster Venom" really represented anything aside from "purple!! ", and that's a tough question to answer. The pattern of the costume, as well as the purple tint, is reminiscent of the Revoltech Venom figure, but are we really meant to believe that Hasbro is taking this opportunity to homage a Kaiyodo action figure? The size does bring to mind the way he was drawn in Thunderbolts - this Thunderbolts, not this Thunderbolts. Venom was pretty much the team's Hulk in that incarnation, so sometimes he got huge! And looking at Mike Deodato Jr's art, maybe the spider did look like this sometimes after all. So there you have it: Monster Venom is Thunderbolts Venom. Until we come up with a better answer. The head is truly wicked. The mouth is open so far that the lower jaw almost lays flat against the chest, and the lips pull back enough that you can see the tendons that hold his jaw on - kind of like the Alien Queen in that regard. He's got crooked fangs aplenty, and his tongue is lashing out in a corkscrew pattern. His eyes are perfectly smooth, and seem to be set below the surface of his skin. Those stand out from the skin itself, which is wrinkly and covered in veins. Everybody loves a vascular villain. An especially vicious vascular villain! 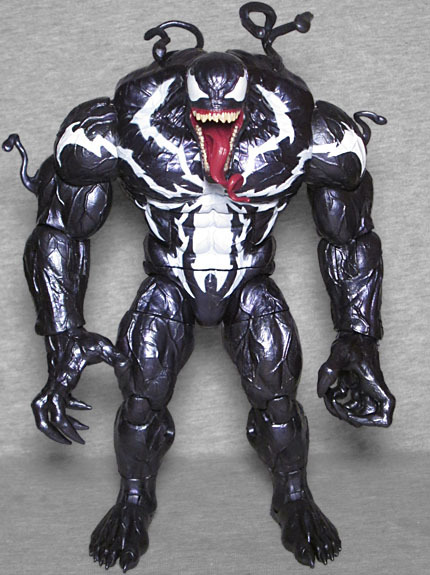 For as big as all the individual pieces of him are, Monster Venom really isn't that tall of a figure. If you just count the bulk of his body, and not the tendrils coming up off his shoulders, he's only a little bit over 7" tall. Part of that is because his natural pose has him slightly hunched over, but really it's because his mass is distributed both wide and deep, not just high - he's a humongous brute of a figure! And he has all the articulation you'd expect a Marvel toy to: a balljointed head, hinged neck, swivel/hinge shoulders, swivel biceps, hinged elbows, swivel/hinge wrists, hinged torso, swivel waist, balljointed hips, swivel thighs, double-hinged knees, swivel shins, and swivel/hinge ankles. The joints are stiff, but just enough to hold up the weight, not enough to make him hard to pose. Monster Venom may not have any obvious, unmistakable inspiration for his design, but that doesn't make the design bad: it's a dark body with a white spider and a long tongue; it's Venom. And in a line that two glorified re-releases, one character picked only for his design, a joke character only included because of his accessory, and one character who has zero to do with symbiotes at all, getting a huge, scary version of Venom that doesn't look like any other one you have is pretty cool.